Readers Digest Christmas Album "Merry Christmas"
Produced by Columbia Special Products, catalog #RDA83-A released 1969.
and 24 more of the world's most popular artists. The L.P. sides on this set were sequenced so that they could be played on an automatic record changer. For example, side 1 was on L.P. #1 side A, side 2 was L.P. #2 side A, side 3 on L.P. #3 side A, and side 4 was L.P. 4 side A. Then when you flipped the stack over, side 5 was L.P. #4 side B, side 6 was L.P. #3 side B and so on. L.P. #1, side A (Side 1) "Hark, the Herald Angels Sing"
1 - Hark, the Herald Angels Sing - Mormon Tabernacle Choir. 2 - Adeste Fideles - Eileen Farrell. The Philadelphia Orchestra and Temple University Choir: Eugene Ormandy, Conductor. 4 - The Lord's Prayer - Richard Tucker. 6 - The Holy City - Richard Tucker. 7 - O Sanctissima - The Philadelphia Orchestra :Eugene Ormandy, Conductor. L.P. #2, side A (Side 2) "Joy to the world"
1 - Joy to the world - The Philadelphia Orchestra :Eugene Ormandy, Conductor. 2 - While Shepherds Watch their Flocks - Mormon Tabernacle Choir. 3 - Christians, Awake - Alexander Schreiner, Organ and Chimes of Mormon Tabernacle. 4 - Break Forth, O Beauteous Heavenly Light - Mormon Tabernacle Choir. 5 - O Come, O Come Emanuel - Mormon Tabernacle Choir. L.P. #3, side A (Side 3) "Deck the Halls"
1 - O Little Town of Bethlehem - Norman Luboff Choir. 2 - It came Upon the Midnight Clear - Johnny Mathis. 3 - Deck the Halls - E. Power Biggs. 4 - The First Noel - Nelson Eddy. 5 - O Tannenbaum - Norman Luboff Choir. 6 - Oh, Holy Night - Jerry Vale. 7- Angels We Have Heard on High - Andre Kostelanetz Orchestra and Chorus. L.P. #4, side A (Side 4) "Here We Come A-Caroling"
1 - Here We Come A-Caroling - Ray Connif Singers and Orchestra. 2 - God Rest Ye Merry, Gentlemen - Robert Goulet. 3 - Away in A Manger - Anita Bryant. 4 - Good King Wenceslas - Percy Faith Orchestra and Chorus. 5 - We Three Kings of Orient Are - Mitch Miller and the Gang. 6 - Silent Night - Charlie Byrd, Solo Guitar. (Medley) - Silent Night - Eydie Gorme and Trio Los Panchos. L.P. #4, side B (Side 5) "Christmas Favorites"
1 - The Christmas Song - (Chestnuts Roasting on an Open Fire) - Mel Torme. 2 - Winter Wonderland - Jerry Murad's Harmonicats. 3 - I'll Be Home for Christmas - The Brothers Four. 4 - Let It Snow, Let It Snow, Let It Snow, - Steve Lawrence and Eydie Gorme. 5 - Blue Christmas - Johnny Mathis. 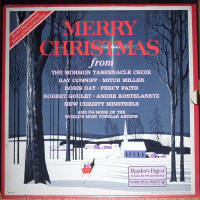 6 - Sleigh Ride - Ray Connif Orchestra and Singers. L.P. #3, side B (Side 6) "Happy Holiday"
1 - White Christmas - Robert Goulet. 2 - Have Yourself a Merry Little Christmas - Doris Day. 3 - Happy Holiday - Percy Faith Orchestra and Chorus. 4 - Silver Bells - Doris Day. 5 - Frosty the Snowman - Mitch Miller and the Gang. 6 - You're All I Want for Christmas - Frankie Lane. L.P. #2, side B (Side 7) "Jingle Bells"
1 - Santa Claus is Coming to Town - Steve Lawrence and Eydie Gorme. 2 - Rudolph, the Red Nosed Reindeer - Gene Autry. 3 - Jingle Bells - Mitch Miller and the Gang. 4 - Christmas Time is Here Again - Marty Robbins. 5 - I saw Mommy Kissing Santa Claus - Jimmy Boyd. 6 - Here Comes Santa Claus - Gene Autry. L.P. #1, side B (Side 8) "The Twelve Days of Christmas"
1 - The Twelve Days of Christmas - Mitch Miller and the Gang. 2 - Toyland - Doris Day. 3 - The Little Drummer Boy - The New Christy Minstrels. 4 - The Coventry Carol - Charlie Byrd. 5 - What Child is This? - Mitch Miller and the Gang. 6 - Go Tell It on the Mountain - Mahalia Jackson. 7 - The Christmas Story - Burl Ives.